Don’t plan the vacation of a lifetime without reading this post of the must have items you need on your packing list for Disney World! Do you remember your very first family vacation as a child? I sure do. We lived in Florida at the time and were getting ready to move with the Air Force to Germany, so it wasn’t too much of a stress to make the trip down to Orlando and visit Walt Disney World. Now I was only 4 when we visited Disney World for the first time but I remember bits and pieces (with the help of pictures) and it was definitely a magical childhood memory. I didn’t return until I was 18 and we decided to visit Orlando for our honeymoon. Being on your honeymoon at Disney World is definitely a special time as well…especially if you get the Mickey and Minnie Mouse ears that are done up as bride and groom. You definitely get a very different experience at Disney World with these special ears marking the occasion. As I write this, I’m realizing that trips to Disney World have been averaging around every 15 years. In October I had a blogging conference at Disney World and couldn’t resist making this a fun, family vacation for the entire family. The girls were 4 and 7 at the time and these seemed like perfect ages to visit. And with the cooler, yet still temperate weather in October this gave us a lot of time to enjoy the experience. Making a packing list for Disney World with a family is a way different experience than doing this as a newlywed. If we thought everything was expensive 15 years ago for just two people, you can only imagine how much more expensive things are when there’s four of you. Planning ahead and doing our research was definitely key. But where do you even start?! A quick search on Google will display an overwhelming number of insider tips, tricks, and suggestions to help with your packing list for Disney World. But which ones are right for you and your budget? And which ones will you actually use? 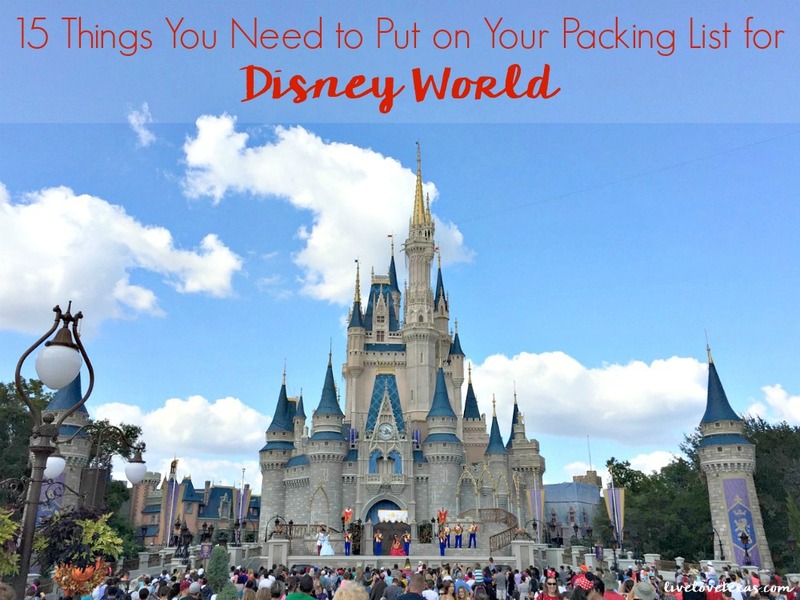 You don’t have to worry about Googling these things because I’ve done the hard work for you and found the items that you can quickly use to build your daily packing list for Disney World. Don’t forget to check out this list of travel tips you can’t live without! 1. Lightweight backpack. You’re going to be spending a lot of time on your feet. Walking and riding so you want to keep your load as light as possible. Start with a lightweight, collapsible backpack that will easily fold up in your luggage but can be taken around wherever you go. A lightweight backpack is definitely one of the key pieces to having a solid packing list for Disney World. Purses and camera bags quickly cause shoulder pain and are cumbersome. Don’t forget to give your back a break and alternate who carries it! 2. Rain ponchos. Don’t let the rain put a damper on your vacation. Embrace the liquid sunshine but don’t pay a ton at the park for rain ponchos, plan ahead. We purchased the Disney ponchos online because we thought it’d be fun but never ended up using them and the weight of these quickly added up. I’d recommend some inexpensive, lightweight rain ponchos just in case you don’t use them on this trip, you could always reuse them at home. 3. Sunscreen. You’ll be spending a lot of time in the sun at the parks and the pool if you go. Make sure you have enough sunscreen with you for the family. You don’t want to pay the inflated prices at your hotel or risk a painful burn. 4. Bug spray. All that moist air and sunshine means the bugs are abundant. If you don’t want to layer up on your sunscreen and bug spray they make combination products as well, though I can’t vouch for their effectiveness. 5. Change. Some of the cheapest souvenirs you can find at Disney World are the smashed pennies. Each machine around the parks and hotels features different characters so for just 51 cents your little ones could have a pretty impressive collection of keepsakes to bring home…and on the cheap!
. We walked 8 miles in our first day traveling and at Disney World. With all of that walking, you need to stay hydrated but individual water bottles and other drinks can quickly add up. These water bottles have built-in filters to keep your water tasting as fresh as possible whether you get it out of the tap in your hotel room or from a soda fountain in a quick-service restaurant. Remember water and ice are free at Disney World! And if you need a break from the water from time to time, throw a box of powdered drink mix pouches into your bag for a fun change! 7. Snacks. If you thought drinks were expensive, you can bet snacks are even more so. If you didn’t buy the Disney dining plan (and in hindsight, we totally should have), then bringing your own snacks is definitely key. I already have to bring along snacks for the plane ride so adding a few more for each day isn’t that hard to do. I like to bring a mix of salty and sweet but nothing that can melt. Popcorn, applesauce, granola bars, and trail mix usually keep us full between meals. 8. Lightweight sweaters/jackets. We usually stick with hoodies but the weight of four hoodies adds up and quickly fills up the backpack. Go with lightweight layers instead, especially in spring or fall or have each person tie their outer layer around their waist. 9. Portable phone chargers. With all of the waiting in line and using the My Disney Experience app (see below), our phone batteries died pretty quickly. Thankfully, we had several portable phone chargers with us so we were never without service. 10. Comfortable shoes. I spend 98% of my life in flip-flops at home and while I wore these on the plane ride to Florida, I knew my feet and ultimately my body would not last five days at Disney World in them. And forget your Toms or Converse – do yourself a favor by packing a pair of athletic shoes. After 8 miles of walking a day, my feet still hurt from the distance, but I didn’t have blisters! 11. Autograph books and pen/marker. Another inexpensive way to have memories from Disney World, bringing along a pen or marker and a small notebook is a fun way to have something to remember each character by. 12. Bubbles. You wouldn’t believe how fun bubbles can be for your kids and others while waiting in line. I can’t tell you how handy these were! We received comments constantly about how genius it was to bring these boredom busters along. 13. Souvenirs. Bring Disney souvenirs from home? You got it. Just think about how much cheaper you can buy Disney products from clothes and stuffed animals to stickers and coloring books at home from Amazon, Target, or the dollar store. Take advantage and stash toys in your bag to bring out at special times throughout the day. Or when the urge to spend money takes hold. 14. Mouse ears. Everyone at Disney World is wearing some kind of mouse ears…well, almost everyone. Don’t get pulled into buying expensive ears in the park. I picked up these Minnie Mouse ears for the girls and I before we left and we were park ready for less than the price of one pair of ears at Disney World! 15. Glow jewelry. There are parades every night and lots of opportunities to drop small fortunes on spinning, glowing jewelry. Save yourself a ton by buying these all things glowing in bulk ahead of time! If you visit Euro Disney in Paris, you might want to check out these International Travel Tips! 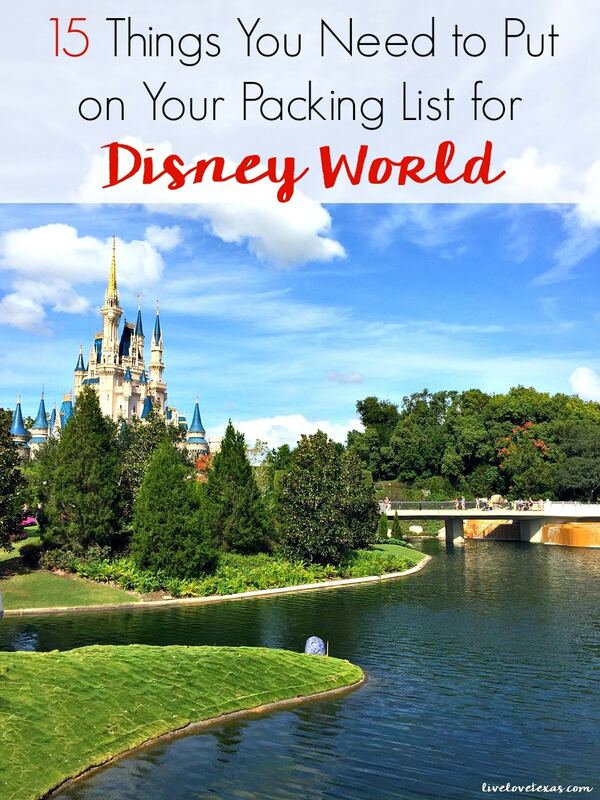 What are the must-have items on your packing list for Disney World? Make sure to follow my travel board on Pinterest for more travel tips!